An unfamiliar machine is featured in a sewing display at the Tread of Pioneers Museum. 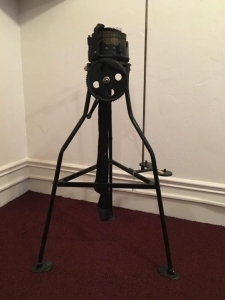 The machine, about four feet tall, has: three metal legs, cranks and gears, and a long antenna-like wire extending from it. Never having seen an object like this in my life, I came to learn that the new-to-me, and perhaps new-to-you, device is called a �circular sock knitting machine.� It was donated to the museum�s collections by the Maguire family in 1966. When Tread of Pioneers Museum curator, Katie Adams, and I searched for a manufacturer�s marking, all we found was the remnants of a gold paper label, now worn off. Which means, unfortunately, I cannot talk about this exact circular sock knitting machine�s brand. Though, I can speak to machines like this one, as well as the culture surrounding sock-knitting in historical and contemporary United States. 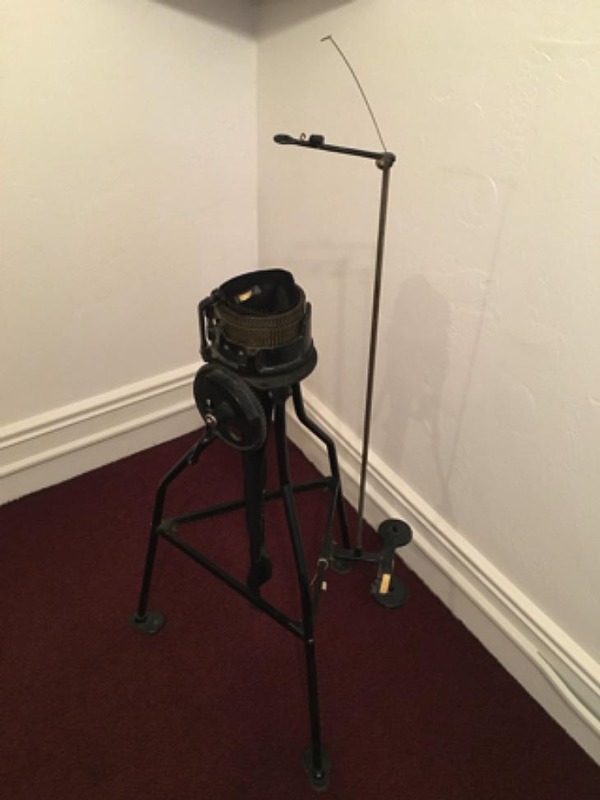 In the late 1800�s, circular sock knitting machines similar to the one in our museum were owned almost solely by families, when mothers and grandmothers provided the families� clothing. 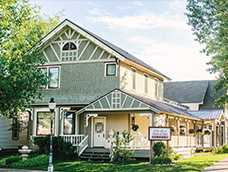 Skills like sewing, knitting, and hemming were necessary to keep the family warm�especially through brutal Routt County winters. It is possible that only wealthier families owned a circular sock knitting machine, one that can crank out seven pairs of socks in one hour, if operated by a very skilled �cranker.� However, by the early twentieth century, sock-knitting was not just something for the wealthy to do in the comfort of their own home, and the call for experienced crankers was high. In an article by CBC news, a contemporary experienced cranker notes about the sock-knitter, �This machine is said to have won the First World War.� From my research, I find this cranker Blake Harris� remark spot-on. At a time when thousands of troops were spending night and day in wet, damp conditions, the immersion foot syndrome Trench Foot was rampant. Wool socks were needed to keep soldiers� feet dry�and oftentimes, soldiers were best off changing their socks multiple times a day. When left untreated, trench foot became gangrenous and no antibiotics were available to treat it. Over the course of the first war, 20,000 soldiers were injured because of trench foot in the British Army alone. Women at home used machines like the one in our museum, on a volunteer basis, to speed up sock production so the soldiers could have dry feet. Today, there�s a collection of people who still see the value in old-fashioned sock production with circular sock-knitting machines. I stumbled across the website for the Circular Sock Knitting Machine Society (CSM), a group of hobbyists in the United States that has been in existence on and off since 2000. Much of my research came from their resources. CSM hosts annual conferences for crankers to get together and teach each other patterns, trouble shoot repairs, and share in the joy of circular machine knitting. Members also host �Crank-Ins� for the same purposes at different locations throughout the year. Contrary to my impression of the unfamiliar machine when it first caught my eye, I discovered that the culture of using circular sock-knitting machines is far from over. More importantly, I discovered that artifacts in our Tread of Pioneers Museum oftentimes have a story that goes far beyond what initially meets the eye. CBC News | Nova Scotia. Posted 11/11/2016 Accessed February 01, 2017.